India is firmly set on a path of economic growth that is estimated to usher in prosperity like never before. This economic prosperity will need to be built on the back of significant transformations across several facilitating elements, the primary ones being infrastructure build-out, energy availability and sustainability. India’s per capita energy consumption currently is almost one-third the global average, and trails far behind the mean figure for the developed world. Our energy consumption is largely based on coal, along with a preponderant dependence on other fossil fuels. Although per capita energy consumption has more than doubled over the past 15 years, almost 240 million people do not have access to affordable energy supply today. Energy consumption in India has grown at a compound annual growth rate of about 6% during the last decade. BP Energy Outlook 2035 expects India to achieve the fastest energy consumption growth among all major economies, despite rapid increases in non-fossil fuel production. The total energy consumption is expected to grow by 128% by 2035. 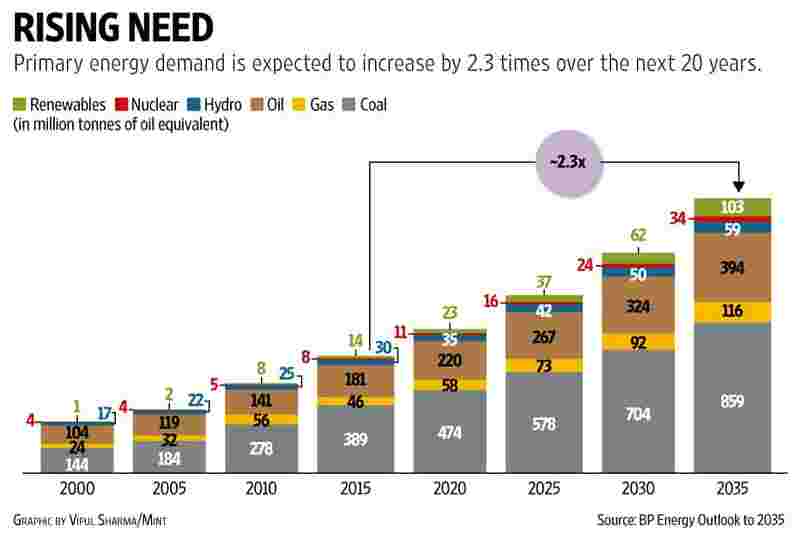 Demand for gas is expected to expand by 155%, followed by coal (121%) and oil (118%), while demand for renewables, nuclear and hydro are estimated to rise by 656%, 334%, and 99%, respectively (see chart). Our potential clearly positions us as the leading global driver of growth in energy consumption in the next 20 years, possibly surpassing China in the process. Even under the most sombre growth scenarios, it is fully expected that India’s growth ambitions will lead to a 100% increase in energy consumption, thereby requiring double the existing energy sources. On the supply side, India is significantly dependent on coal as a primary fuel, which accounts for 58% of the energy consumption in the country. It is estimated that we have one of the largest resource bases of coal, with the policies and gains of the past few years positioning us strongly for the future. It is expected that India will be the largest consumer of coal, equivalent to over 435 million tonnes of oil by 2035. According to current estimates with respect to oil and gas, India is home to only 0.3% of the world’s sedimentary basins. Further, we account for a mere 0.3% of the global oil and 0.8% of the global gas reserves. We are, however, blessed with abundant natural resources in the form of sun and wind. The total wind potential in the country is estimated to be over 30 times the current installed capacity of 27 gigawatts (GW), while our solar potential is expected to grow by about 90 times the current installed capacity of 8GW. Already, the government has an aggressive target of 60GW of wind capacity and 100GW of solar capacity by 2022. Successive governments have embarked on addressing the forthcoming challenge at varying intensities and levels of aggressiveness. There are, however, some structural issues that affect the sector. Firstly, we have successively underpriced our resources, making the economics of the sector unattractive to a large number of serious investors. The energy subsidies over the years have been a major burden to the economy. The total subsidy for 2014-2015 was Rs76,285 crore. The diesel price deregulation and direct benefit transfer of liquefied petroleum gas subsidy coupled with low oil prices, led to a 64% drop in the subsidy burden for 2015-2016, which now stands at Rs27,571 crore. Gas prices in the country have also been fixed by the government based on different regional benchmarks. Domestic prices were reduced by over 50% from $5.1 per million British thermal units (mmBtu) in November 2014 to $2.5 per mmBtu for the period between October and December 2016, making the sector unviable for producers, even though the country is in a supply deficit. Given this scenario, the newly announced pricing regime that promises market prices for natural gas produced from forthcoming fields is a favourable step to attract investment in the sector. While the government has provided support to several segments of our polity at different points in time, the mechanism of delivering such support has been inefficient. Secondly, past events in the policy and governance ecosystem have created the impression of a less-than-desirable regime of instability and lack of administrative efficiency. Thirdly, the relative naivety of infrastructure financing in the early years resulted in increased corporate leverage, without commensurate assets to underpin the debt levels, thus putting pressure on stakeholders, including financial institutions. These three factors, coupled with inefficient underlying processes and systems, have reduced the attractiveness of the sector to investors, whose participation is crucial for us to fulfil our 2035 aspirations. Our current path of growth and evolutionary reforms is likely to widen the gap between the supply and demand of energy, and has potential to cripple any “aggressive" growth plans. If no significant changes are made to the current trajectory, India might increase the burden on the fiscal front associated with energy independence and sustainability. We will then need to import significantly larger quantities of primary resources to fulfil our growth ambitions. BP expects India’s energy production as a share of consumption to decline from 57% in 2014 to 54% by 2035, and imports to rise by 153%. The country’s oil imports are expected to increase by 161%. This will account for 52% of the increase in imports, followed in volumetric terms by increases in coal imports by over 122%, and gas by over 301%. The future of India and its economic growth plans are critically linked to the fortunes of the energy sector. To propel this key primary sector to the next level, we need a combination of bold and aggressive moves, and a “clean up" to bring in more efficiency and effectiveness. The moves need to be comprehensive and coordinated. They must be focused on all aspects of managing the demand side, while fomenting the supply side, ensuring that critical enablers are in place, and firing on all cylinders. Given our requirements, the Indian energy landscape will continue to be a combination of fossil and new energy based solutions over the next 20 years. It will be important to get the balance right. The key question is, “is it time to get even bolder on renewables"? The present government has certainly made huge strides in achieving our renewables aspirations. Can we be the country that sets the course for a new development model for the energy sector? Can we blaze a new trial by learning from the mistakes of the more developed countries with regards to renewables? Is it possible for us to create a new paradigm for sustainable and viable development of the sector as the core to energy independence? All these would imply significant public and private investments in developing cost-effective technologies for the generation, storage and distribution of energy. So the main concern here is, “is it better to channel government money earmarked for resource segments toward bets on the future of renewables"? Significant innovation, both in terms of technologies and business models, will have to be made to turn the entire value chain into an attractive proposition. The key is to accelerate the process of building scale, experience, talent and knowledge, in order to help us advance the large-scale viability of the sector by many years. Secondly, commodity cycles normally go through high and lows. Currently, we are in one such trough. Is it time to make some aggressive moves that secure our fossil-related resources? The prolonged run of lower oil prices afforded the government an opportunity to create an investment fund to help Indian oil and gas companies bolster domestic as well as overseas investments. While some companies are actively seeking overseas opportunities by leveraging their own financials, we seem to have missed the opportunity for setting up a sovereign oil fund. The basis of this one-time infusion of funds to secure everything from resources to strategic reserves is paramount to our future energy independence. The often-mentioned challenge of “how would we administer such a fund?" is, at best, rhetorical. Our inability to find answers to such administration challenges has laid many a good idea to an early rest. Thirdly, we must consider complementing our initiatives for supply augmentation with measures that help increase our efficiency in managing demand. These initiatives also need to be supported by policies and regulations like time-of-day pricing, incentives and so on, along with large-scale investment in efficiency boosting technologies across the value chain. Finally, there is a need to rationalize the energy governance software infrastructure. The existing resource-focused governance structure (coal, oil and gas, renewables, etc.) should give way to a more integrated and comprehensive mechanism. Such a mechanism must help us understand the complex trade-offs, and allocate both human and financial resources with energy independence in mind, rather than just the “oil versus gas versus coal versus renewables" paradigm. The audit and licensing mindset must be replaced with effective measures to drive flexible administrative mechanisms that are more facilitative and supportive. In conclusion, the future of the economic growth of India is dependent on our ability to leverage energy sources to fuel our ambitions for the sector. In his book, The Audacity of Hope, Barack Obama, states, “A nation that can’t control its energy sources can’t control its future." Securing our energy future is thus critical for India to become a superpower in the future. Kaustav Mukherjee is a senior partner and leads the energy practice at BCG India, and Rahool Pai Panandiker is a partner and director at BCG.